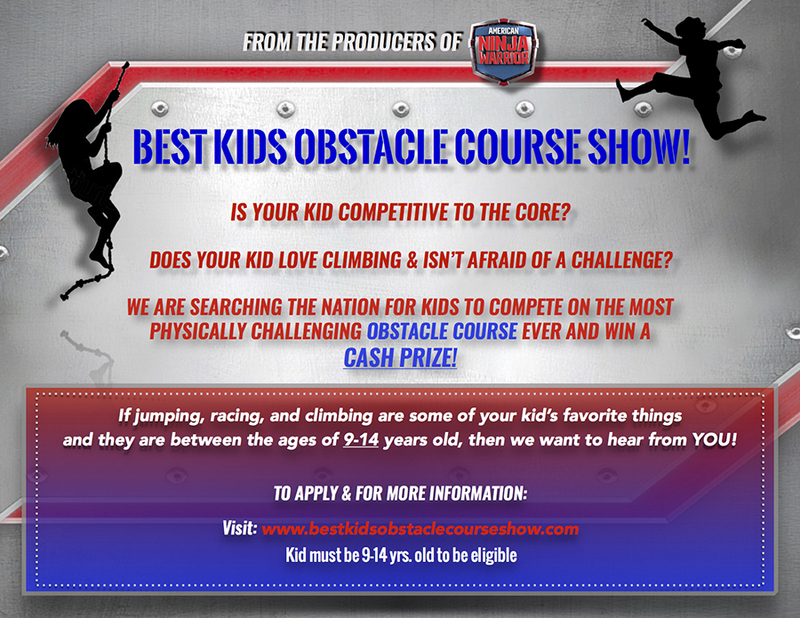 You are at:Home»Featured»Best Kids Obstacle Course is NOW CASTING Kids for Their New Show! From the Producers of American Ninja Warrior comes the ultimate kid’s competition show! I don’t know about you – but since the day American Ninja Warrior hit TV programming I have been hooked! I have never been a workout junkie or anything – but I did always imagine how fun – albeit hard work – it would be to compete on the show. My son, who is now 18, would always comment that he would be a great candidate for the show! And while it’s a little late for him – we got some exciting news a couple of weeks ago that I think you will love! Is your kid competitive to the core? Does your kid love climbing & isn’t afraid of a challenge? The new Best Kids Obstacle Course show is searching the nation for kids to compete on the most physically challenging obstacle course ever and win a cash prize! If jumping, racing, and climbing are some of your child’s favorite things and they are between the ages 9-14 years old, then you need to get in touch with them! Makanan Yang Sehat Untuk Penderita Penyakit Hipertiroid – Brokoli, Makanan yang mengandung Vit D, Produk Susu, Minum Teh Hijau, dan Berry.